Darren Hosie knows all the best bars on Shanghai’s historic Bund. There’s the Bar Rouge with its flaming drinks, house music and turbocharged hedonism; M on the Bund which channels 1930s sophistication; and Lounge 18 whose expensive wood panelling and wall to ceiling glass windows exude a more modern glamour. Hosie has lived in China for the past three years and is well accustomed to the tastes and whims of the country’s new business elite — the legions of bankers, entrepreneurs, traders and second-generation wealthy, known as “princelings”, who think nothing of dropping $200 on a bottle of French wine or $1,000 on a bottle of scotch whisky that they’ll then mix with green tea. Tonight the Scotsman is in the Shanghai Tang bar, watering hole of China’s best known luxury label. Sitting on a straight-backed, wooden chair in front of a tasting audience, Hosie is clean-shaven ahead of an evening of whisky-nosing and tasting sessions. 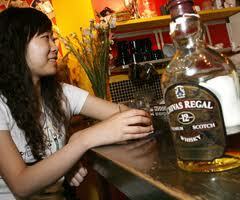 The key to China’s drinkers, he says, is to understand that respect and status are often expressed through drink. Unlike in the United States or Europe, where partygoers tend to buy their drinks by the glass, Chinese drinkers see the bottle as a status symbol. “Here it is very much about having the bottle on the table and letting people see what you are drinking,” said Hosie, sipping water on a pit-stop between whisky tasting sessions in a luxury Shanghai restaurant painted bright green.